This course is designed for ladies only. 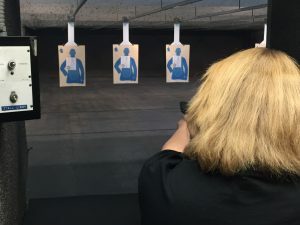 Whether you’re an avid shooter, or have never fired a gun, this class will take you step by step through the basics of marksmanship, safety, and understanding in the differences in types of pistols and their function. Instructors encourage you to bring any questions that you have ever had about firearms or self-defense. Students will have the opportunity to shoot various common calibers and types of handguns. If desired, the student can bring in their own handgun and ammunition to shoot during this class. Bonus – You will receive a coupon which is good for one free range fee upon completion of the course.